It smells so good, you'll want to eat it. You'll have to exercise self control :) If you are a chocolate lover, your favorite little indulgence is about to work wonders on your skin. The perfect portion of chocolate to stash in your travel bag. This scrub? Pure. Decadence. Twist off the top and you’ll swear you’re smelling freshly-baked cookies. That’s all thanks to a mix of cacao nibs, sweet almond oil, and brown sugar. Combined, these ingredients will whisk away any flakes and bumps and allow your fresh, bright skin shine through. 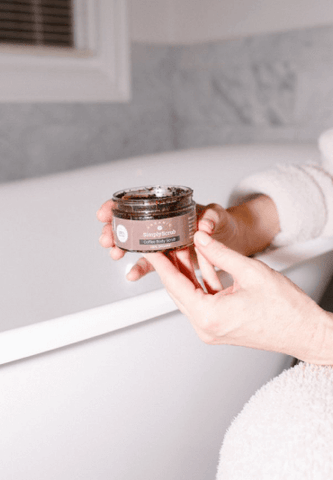 With a hefty dose of moisture from cocoa and shea butters, and essential oils, you’ll be sealing in all that goodness and making sure your skin stays in tip-top shape all day long. Little jar. Big results.